The life history of this gentleman - one of the most able attorneys and criminal lawyers of Northern Illinois - possesses unusual interest. A man of strong traits of character and decided views, he is also possessed of great courage, fearless in the denunciation of wrong, and steadfast in upholding the right. He is in fact one of the comparatively few men ahead of his time; and in consequence has thought and studied much over the problem of life. Like all men of any consequence, he has suffered from the malice and envy of enemies; but, more fortunate than some, has been permitted to witness their defeat through his own vindication. He has abundant reason to remember the issues of the Civil War, and during that period was brought prominently before the public, charged with misdemeanors, acquitted by default, and justified by the withdrawal of the charges against him. This epoch in his life forms a chapter which has taken its place among the National records. Since coming to this county, more than fifty years ago, Mr. Sheean has made the practice of law his business and his study. A native of Boston, Mass., he was born July 3, 1833, of parents who were natives of County Cork, Ireland. His father, James Sheean, emigrated to America when a young man, locating in Boston, where he was married to Miss Mary Lorden, who had crossed the Atlantic from Ireland with her parents, Jeremiah and Johanna (Crowley) Lorden, when a mere child. Mr. Lorden had been a strong man physically, was industrious and frugal, and a loyal inherent to the faith of the Catholic Church, in which he had been trained from boyhood. His wife survived him a number of years, came to Galena and made her home with her daughter, Mrs. Sheean, for a time. Later she took up her abode with her daughter Catherine, Mrs. Galvin, and died there when ninety-eight years of age. She was to the last smart, bright, and active. The father of our subject lived in Boston until after the birth of three children - David, Jeremiah L., and John; then coming to Illinois, took up his residence in Galena as early as 1837, when it was a mere hamlet. After reaching the Ohio River they embarked on a Mississippi steamboat, by which means they reached this county. The spring following (1838) they located on land in Guilford Township, where the father filed a "squatter's" claim and held it until the land came into market. He then purchased it and began making improvements, sojourning here until his death, which occurred April 18, 1857. He was then fifty-five years old. He had become widely and favorably known to the people of this region as a man honest and industrious, and one who assisted in maintaining law and good order in his community. His wife is yet living with her son, Thomas Sheean, who, with his brother James, was born in this county. Thomas is now in partnership with David, our subject; while James owns and operates the old homestead in Guilford Township. Mrs. Mary (Lorden) Sheean was born March 10, 1812, and although now aged, is strong in mind and body, her faculties being preserved to a remarkable degree. She was reared in the doctrines of the Catholic Church, to which she steadfastly adheres. David Sheean lived with his parents on the farm until a youth of eighteen years, and in the meantime had been a student two years at Galena Academy. Later he taught school during the winter season, and in 1851 started for California via the Isthmus of Panama and arrived in San Francisco on the 8th of January, 1852. He afterward visited different places in the Golden State and finally operated in the placer mines, remaining in that region until March, 1856. He was quite successful, and returned home by way of the Isthmus and the Island of Cuba and New Orleans, thence up the Mississippi, arriving home in May, 1856. This experience, the sea voyage, and his sojourn in the Far West, were the source of a rich knowledge with which he would not willingly part. He came in contact with all kinds of men from different parts of t he world and gained much useful information. Immediately after his return home, Mr. Sheean entered the law office of John A. Rawlins, Secretary of War under President Grant, and formerly on the staff of Gen. Grant. He was in his boyhood days a schoolmaster with our subject, and with him young Sheean remained until he was admitted to the bar by the Supreme Court of Illinois. This was then presided over by Judge John D. Caton, Chief justice; Sidney Breese, and Pinkney H. Walker. After his admission to the bar Mr. Sheean commenced the practice of his profession with his former preceptor, Mr. Rawlins, and the partnership existed until January, 1862. In the meantime Mr. Rawlins became an aide on the staff of Gen. Grant, and after he withdrew from his law practice, Mr. Sheean conducted it until 1867. He then associated himself with his cousin, Philip J. Galvin, and later took into partnership his brother, Thomas J., with whom he is still associated. The Sheean brothers have been extremely successful in their law practice. During the progress of the Civil War our subject had an experience similar to that of M. Y. Johnson, which is detailed in the biography of that gentleman elsewhere in this volume. Both were arrested and imprisoned, failed to obtain a hearing although making the most earnest efforts to do so, and were finally released without even knowing the charges, by reason of which they were deprived of their liberty. The same judgment was rendered by the Supreme Court in Mr. Sheean's case, as in Mr. Johnson's. Dear Sheean: - I see by the Chicago Times of the 27th, which I received this afternoon, that you have been released from your arbitrary and unjustifiable imprisonment. Let me assure you nothing has occurred in a great while that has pleased me more than to know, as I now do, that one whom I have known from earliest recollection has been restored to liberty, and the rights which every American citizen is entitled to enjoy; feeling as I do that your arrest was but the result of the personal malice of --------- seeking revenge their cowardly and craven souls failed to find in their attempt at personal violence against you. Soon after my return from home I made a statement of your arrest and accompanied it with letters from Gen. Grant, Hurlburt and Logan, and one from Rowley and Maltby, and forwarded to the Secretary of War, copies of which I sent to (brother) Lemon from Jackson, Tenn., on the 3rd of November last, the day we moved from that place. Subsequently I wrote to the Hon. E. B. Washburne, calling his attention to the subject of your imprisonment and to my statements to the Secretary of War in your behalf. Whether it was ever read I can not state, or if it had been, it had any effect I do not know. Of one thing, however, I am sure there was nothing in it but what was true and would meet with the approval of yourself and family I am as firm to-day in the support of my Government and yours as ever. I believe that if the war is properly conducted it must finally end in the triumph of the government established by our fathers, and whether it ends in one year or ten, I am for its vigorous prosecution; but to the arrest of loyal citizens and imprisonment without trial I am opposed and shall be opposed to the end of life. For the maintenance of my country's honor and the upholding of the Constitution I am willing to take my chances on the field, but for the destruction of individual liberty - never. We can have but one Government on this Continent, north of Mexico and south of the St. Lawrence, and that must be the United States of America. There is little if any difference of opinion in the army - all are for the success of our flag, and little is said of proclamation. The marriage of David Sheean and Miss Cora L. Spare was celebrated it the bride's home at Galena, Sept. 21, 1876. Mrs. Sheean was born Mary 25, 1850, at Utopia, Ohio, and is the daughter of John C. and Hettie (Gallagher) Spare, who were natives respectively of Wilmington, Del., and Harrisburg, Pa. The father was born March 7, 1818, and the mother Nov. 29, 1822. They were married in the latter State and emigrated to Illinois as early as 1840, settling in Galena, where the father was engaged in various business enterprises. The mother died in Aug. 18, 1884 at the age of fifty-six years; she was a very estimable lady, and a member of the Presbyterian Church. Mr. Spare contracted a second marriage with Miss Gilson, and they are now living in Chicago, Ill., where he is engaged in the coal, wood, and feed business on State street. Mr. Spare is a liberal-minded citizen and warmly interested in the temperance work. Mrs. Sheean was reared and educated in Galena and is a lady of many accomplishments, refined and cultivated tastes. 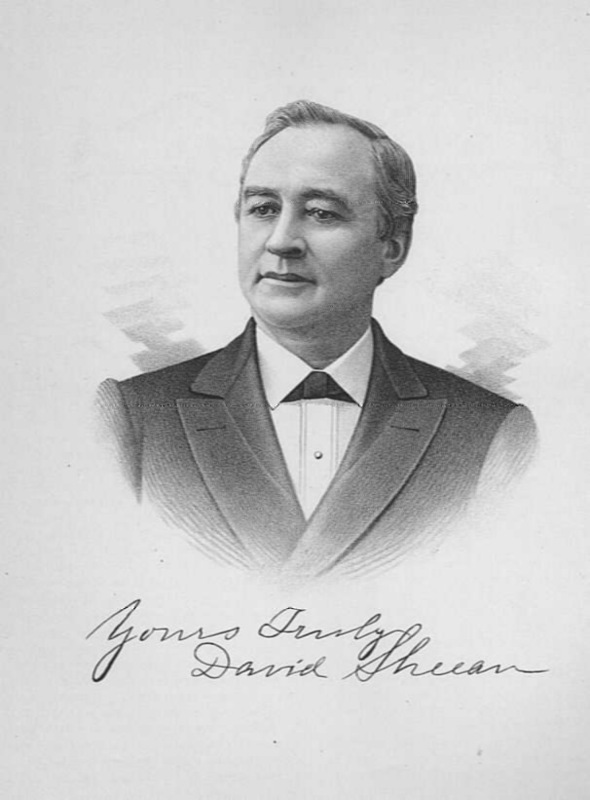 Mr. Sheean, politically, is a Jackson Democrat, and although keeping himself thoroughly posted upon the march of State and National events, has never sought office, preferring to give his time to his profession in which he takes and honest pride. He is held in high respect by his fellow-citizens, who elected him to the office of Mayor, and he has served two terms as City Attorney. In Galena he enjoys the confidence and esteem of its best people. In religious views he is liberal-minded and stands upon the broad platform advocating the liberty of religious thought, believing that each man should be governed by the dictates of his own conscience. As a lawyer he has participated in some of the most important Causes Celebre which have shed lustre on the bar of Northern Illinois. As an advocate he is eloquent and forcible. We invite the attention of the reader to a fine portrait on a preceding page.